It is every foreigner’s nightmare, at least if you are living in Tokyo. Every so often, you have to go to the Tokyo Regional Immigration Bureau. It is the only place where you can make any amendments to your visa and everyone has to go there sooner or later if you plan to live in Japan for an extended period. Timing is everything when visiting the Tokyo Regional Immigration Bureau and it isn’t a fun trip. In Tokyo, the government, I’m not sure which one, decided to put it on an island just outside of Shinagawa with nothing but factories surrounding it. It takes a bit of time to get there and when you do get there, you get to join the hundreds of other people where you just wait in various lines. 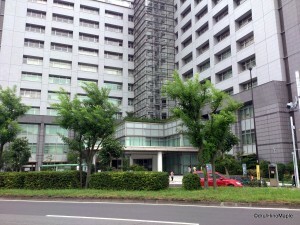 The Tokyo Regional Immigration Bureau is located in a relatively remote area of Tokyo. For the smart people, you head to Shinagawa before taking a bus that drops you off on a small island about 1km from the nearest train station, which happens to be on the Tokyo Monorail. Otherwise, it will be a 2 km walk to get there from Shinagawa. Either way, it is much better to take the bus rather than walk, as I found out the hard way the very first time I went there. I, along with many of my friends, theorize the location is to keep things safe for “Japanese people”. 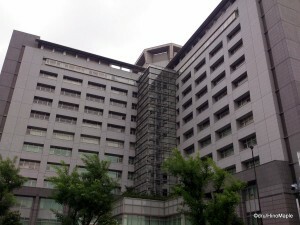 The Tokyo Regional Immigration Bureau is also the detention centre for people who have been caught overstaying their visas, but thankfully I have never had a need to see the inside of the detention centre. The building itself is a very drab gray building, but the shape is fairly interesting as it is in the shape of an X. Upon getting there, you make your way in with the rest of the people on the bus and then decide which section you need to get to. 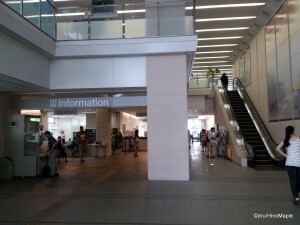 For people looking for help, there is an information desk at the entrance, but for the majority of people, the second floor is where all of the action takes place. Separated into 4 sections, they are neatly organized by colour and letter. 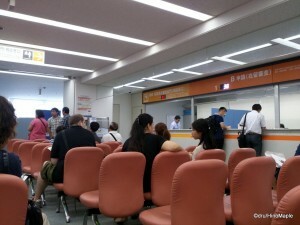 The very first time I went to the Immigration Bureau, it was not a happy place to be and everything was unorganized. Thankfully things are a lot better now but it could still be a lot better. For most people, the first visit will be at the orange (B) section. This can change in the future but so far I haven’t seen any changes in my 8 years here. In the past, you would grab a number and just wait. 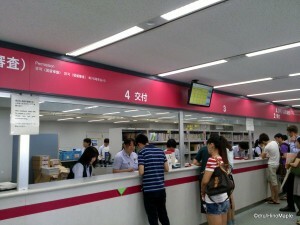 Today, there is a document inspection line before you can get your number to wait for an official. The line moves relatively quickly depending on how prepared the people in front of you are. If you have something missing, they will tell you how to fix it. I highly suggest filling out all of the forms ahead of time so that you don’t have to worry about having to return again as they will not give you a number unless you have all of your documents in order. If it is a small detail that needs to be filled in, they will let you know and you can fill it in as you wait to see an immigration officer. After the document check, you are given a number and then you have to wait. In the morning, it can take roughly 60 minutes and wait times get progressively longer after that. I had to wait several hours once when I went in the mid afternoon for my very first visa renewal, but this was also due to the unorganized nature of the centre at the time. I was on a working holiday visa and had no clue as to what I needed to do. I was shocked to learn I had well over 100 people in front of me. These days the process, as I said, has been worked out a lot and it is pretty fast. My most recent visit saw me wait for around 60 minutes. It no longer feels like a mad house but rather a slaughter house where all the cattle are lined up and ready to be slaughtered. The other area of interest is the red (A) section. This is where you go if you have been approved for your visa. After applying for a visa or a visa extension, you are given a piece of paper and told to wait about 2-3 weeks. You will be notified by mail on what to do after that, and usually you’ll have to write a postcard with your address. When you get the postcard, you have to bring that along with any other relevant documents to the Immigration Bureau again. Instead of heading directly up to the red section, you have to head to the convenience store located near the entrance. You have to line up to purchase stamps. The officers do not have any cash on them so the convenience store is set up to do all of the transactions for them. You have to purchase stamps to prove you have paid for your new visa and then proceed to the red section. 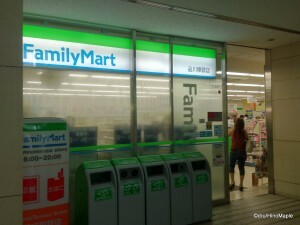 The postcard will tell you how much you need to purchase, and there are signs in the convenience store as well. After you get your stamps and head up to the red (A) section, you must line up once again where they inspect your documents, grab your passport and residence card, and then proceed to make you wait. The line to get your documents inspected is a lot slower than the line in the orange section as they need to confirm your identity. It used to be faster than the orange (B) section, but in recent years it has been slower. My most recent trip had me make one small mistake. I forgot, rather didn’t know, I needed a special sheet to prove my payment. They had thousands of these sheets ready and all you have to do is affix the stamp to the paper, write the amount, tick the correct box, and sign. Once that is done and you get your documents inspected, they take your passport and residence card and begin to issue you your visa. They obviously give you a number to wait, and once it is ready, they call you up in groups to pick up your passport. The wait to get your visa takes longer than the application. It took me 1.5 hours on my most recent trip and I had arrived at the immigration bureau at the same time as my previous application, roughly 9:30am. With the new immigration laws, started July 2012, they no longer issue a visa stamp into your passport. Instead you are given a residence card, similar to the Alien Card with all of your visa information. It is a lot simpler and I’ll be writing about that soon. The Immigration Bureau is every foreigner’s nightmare. It is a necessary evil for those who wish to live in Japan. I have always hated going there as it is akin to going to “jail” in order to prove I am still a good person and can continue living in Japan. Maybe it is more alike going to a parole officer and asking for permission to not be put back in jail. Either way, while the officers working at the Immigration Bureau are not bad people, they have a tough job and I’m sure they get a lot of heat from other foreigners. I always try my best to be polite and just keep quiet. Whenever I give my documents, I just answer any questions they have and also try not to make a fuss. Remember, they have the power to kick you out of the country that same day. It is like yelling at a police officer. You don’t do it unless you want to go to jail. I have only a couple tips when visiting the Immigration Bureau. Be patient, bring a book or smartphone, be polite, and dress nicely; also, don’t forget to smile. Note: Information of this post is from my own personal experience. Your experience at the Tokyo Regional Immigration Bureau may differ. Be sure to contact them directly if you have any questions. This entry was posted in Tokyo and tagged Immigration, Immigration Bureau, Immigration centre, japan, Japan visa, passport, Shinagawa, tokyo, Tokyo Immigration, Tokyo immigration centre, Tokyo Regional Immigration Bureau, Visa by Dru. Bookmark the permalink. I have a very different experience/perspective: Shinagawa Immigration is a paradise of friendly efficiency after coping with the mind-boggling, soul-destroying, brain-obliterating incompetence of Africa’s bureaucracy. Interestingly enough, I had my first unpleasant experience yesterday, but it was very brief: the person who “helped” me at the counter was a perpetually disgruntled oyaji with an ill temper. Then again, if I had to cope with “the wretched refuse of your teeming shore” and screaming toddlers every day, I’d also be sour! I actually wrote this in August, I think. Just sitting in my line of posts to post. You just happened to coincidentally be there when I decided to have it scheduled. I guess you can look at it that way. My very first experience there really tainted my view of that place and still does. But, they amalgamated the two offices together and moved into the harbour area. However. both the old locations and the new location are extremely conveniently located on subway lines unlike Tokyo’s seemingly “middle of nowhere” surrounded by big trucks immigration bureau location. At least, they can problem reduce their land costs. To be honest though, in the 3 Osaka locations and the 1 Tokyo immigration office I’ve been to, they’ve all been staffed by friendly-enough and helpful-enough staff. I think the impression that I got was that people hate the waiting around plus hate the hours of operation since they are typically forced to take a day off of work. Do other people have any truly negative experiences? The most negative experience I’ve had in any of the locations was someone (someone waiting… not staff) watching TV on his phone very loudly without headphones despite it being a quiet waiting area. Osaka sounds great. I heard Chiba isn’t too bad either with much shorter lines. I don’t know why I have to go to Shinagawa all the time, but that’s the law. In terms of bad officers, aside from my last experience which was… almost trouble, I haven’t had any problems aside from waiting. I have seen people get annoyed, but mostly, as you said, the foreigner side. Usually pretty quiet when I go there.